The following is a list of articles I have recently published. It highlights a core set of hybrid cloud computing contents which I want to share and help IT pros better understand at this juncture. App Controller (http://aka.ms/appController) is a component of Microsoft System Center as a self-service portal for managing a hybrid deployment environment. On one hand, App Controller connects to System Center Virtual Machine Manager (VMM) servers and manage VMM-based private cloud resources. On the other, App Controller can also connect to multiple public cloud service providers like Windows Azure and 3rd-party vendors for managing resources deployed to off-premises facilities. As part of the Microsoft System Center family, VMM and App Controller together strategically converge all IT cloud deployment models (i.e. private, public, and hybrid clouds) into a common and management platform. A free ebook highlighting essential concepts and operations is available for download. Here is a quick walkthrough of the user experience. 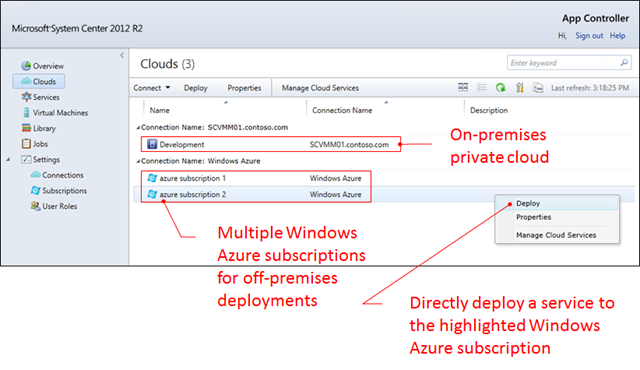 The following shows two Windows Azure subscriptions as indicated by the subscription IDs are connected with an App Controller instance. Within App Controller in this setting, an administrator can manage the two public cloud subscriptions for off-premises deployment and a VMM managed private cloud for on-premises deployment. The security of App Controller is a role-based model. 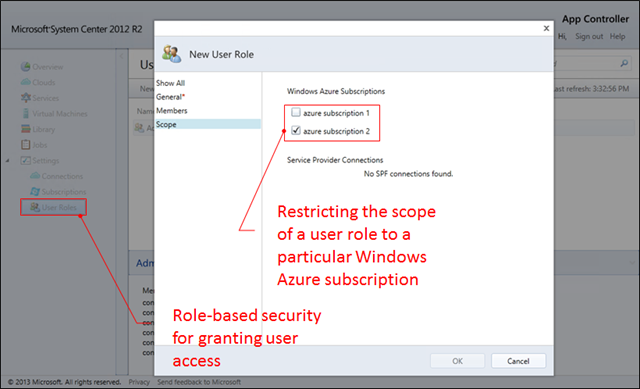 Within App Controller UI, under Settings one can create a User Role where to restrict access to a Windows Azure subscription, as shown below. QSK is a small tool that I wrote to facilitate the learning of Windows Azure Infrastructure Services and Windows Azure PowerShell cmdlets. It documents the deployment methodology with logical steps for configuring and deploying Windows Azure Cloud Services and VMs. In this 3-part screencast series, you will learn the pre-requisites, how the PowerShell script is structured, and what the user experience of running QSK is like. Please notice the Windows Azure PowerShell cmdlets employed is as of Jan. 2014.